Welcome back to Top Ten Tuesday! Once hosted by The Broke and The Bookish, it is now hosted by That Artsy Reader Girl. It’s a weekly book feature where a topical list-prompt is posted and readers respond with their top ten for that prompt. Yours truly tends to go over ten, but hey, what can a passionate reader do? Ironically enough, for someone who is an absolute sucker for romance, when working on this post, I couldn’t for the life of me come up with couples?! I know there are a ton that make my heart soar beyond those I listed below, but you know how it goes. You always have an answer ready in the back of your mind until the answer is demanded of you. Then, it’s as fleeting as the wind. Cait and Griffin in The Kingmaker Chronicles by Amanda Bouchet: I think their romance might be one of my favorites of all time. I just connected with Cait so much and Griffin made my toes curl with his strength. I will love these characters until the end of time. Honoria and Blade in Kiss of Steel by Bec McMaster: Though I adore this entire series and it has ignited in me a need for steampunk romance that I feel will never be fulfilled (seriously, I need all of the books recs of this subgenre, please), I think, out of all the pairings, Honoria and Blade might be my favorite. Vin and Elend in Mistborn by Brandon Sanderson: It’s still too soon, honestly. I just loved watching them grow together and having my heart ripped to shreds by them. Bridget and Benedict in The Aeronaut’s Windlass by Jim Butcher: Almost all of the men in this book attempted to ruin men for me in real life, because MANNERS ARE EVERYTHING. Seriously, the eloquence shown here made me swoon utterly and I am just so here for these two and ready to see what happens in the sequel. Lady Vlora Flint and Olem in The Gods of Blood and Powder by Brian McClellan: I wasn’t the biggest fan of Vlora to start out, but she definitely grew on me in this series. So much so, that if there is ever a threat against her and Olem (and they are in the middle of a war where they are both pretty prevalent leaders, so threats are everywhere), I am ready to throw a riot. LET THEM GROW OLD TOGETHER, DAMMIT. The Twelve Houses series by Sharon Shinn: So, this is the most embarrassing of all. I own this series and I remember reading it. I remember loving these books, back in middle/high school. I remember there were two characters who’s love story broke my heart so completely that I can still see flashes of scenes I’d depicted when I read it to this day. Can I remember anything about these books or who those characters were? Not a lick. Hence why this is a priority reread for me, this year. Aragorn and Arwen + Faramir and Eowyn in The Lord of the Rings by J.R.R. Tolkien: I mean, do I really need to explain anything more? I felt they were all perfect for each other and I will never get enough of them. 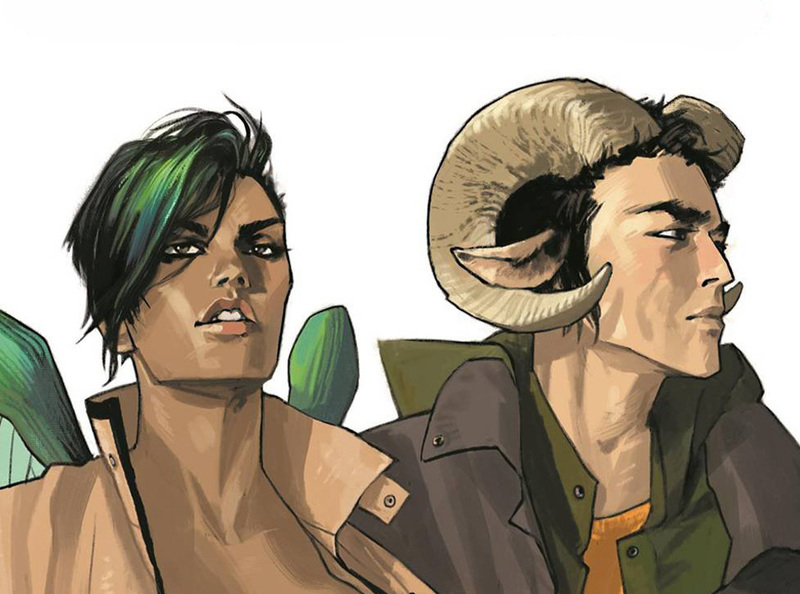 Alana and Marko in Saga by Brian K. Vaughan and Fiona Staples: Okay, talk about a series BREAKING YOU. I don’t usually read comics (a girl only has so much time in her day, you know?) but I’ve read the first three volumes of Saga and I am HERE to get my heart destroyed and ripped to pieces thanks to every aspect of this story, not least of which their romance (even if I’ve avoided reading the rest even though I own ALL OF THEM because, you know, a heart can only take so much of a beating before it needs a break, too). Please, please, please, no spoilers. Remus and Tonks in Harry Potter and the Deathly Hallows by J.K. Rowling: We don’t really need any elaboration on this one, do we? I’m actually mad at myself because I seriously can’t remember so many couples that I know I love and I have a feeling I’m going to be beating myself up when I read everyone’s lists. But seriously, if you have recommendations of wonderful love stories within fantasy, science fiction, steampunk, regency romances…HIT A GIRL UP. I am always looking for a good (and often heartbreaking, usually, though I’m a sucker for HEA, too) love story. I totally agree with your picks from the Lord of the Rings series. Bravo. I can’t believe I forgot about Remus and Tonks! Such a great couple. I have a feeling I’ll be saying the first half of that sentence in almost all of the posts I read as I catch up this evening. 😛 But right!? I adore them. I think Eowyn and Faramir are totally underrated and I just adore them. Yay! Yes, they definitely are! Most people mention only Arwen and Aragorn. I used to be ashamed by how much I’m a sucker for a good romance (for some reason, it was really bashed growing up) but now, I just let me little romantic heart fly. 😛 No shame if it isn’t your cut of tea, though!